Chiang Kai-shek was a soldier and President of the Republic of China, born in Xikou on October 31, 1887. He was an officer in the army of the Manchu empire, but supported the Chinese Xinhai Revolution of 1911 that converted China into a republic. He led the Republic of China from 1930 to 1949 on mainland China until he was overthrown by Mao Zedong. He then fled to Taiwan where he ruled from 1950 until his death in 1975, although his government was still officially called the Republic of China. 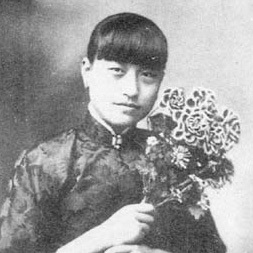 Chen Qimei, Chiang's Zhejiangese mentor, who introduced him to the Tongmenghui but was assassinated at Yuan Shikai's behest in 1916. 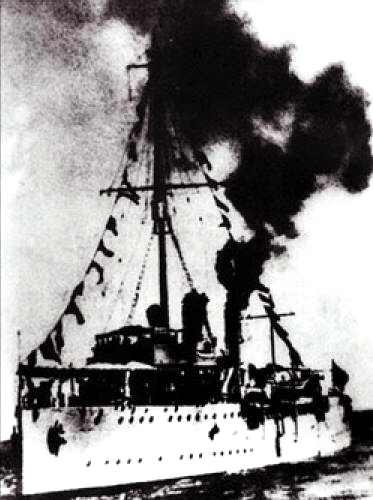 The SS Yongfeng (later Zhongshan), where Chiang watched after Sun Yat-sen for two months in 1923 and which was later responsible for the 1926 Canton Coup that propelled Chiang to leadership of the KMT. Sun Yat-sen and Chiang at the 1924 opening ceremonies for the Soviet-funded Whampoa Military Academy. 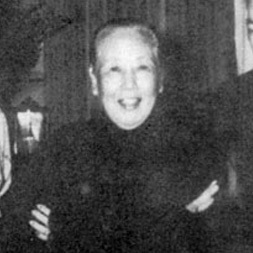 Chiang with Mikhail Borodin, a prominent Soviet advisor to the KMT and its NRA. 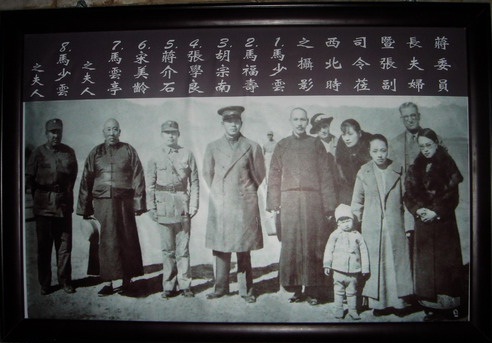 Chiang with Sun's widow and her family in 1929. Chiang with Tsuyoshi Inukai and Pan-Asianist Tōyama Mitsuru in Japan, 1929. Chiang, leading the Northern Expedition in 1926, on the cover of a 1933 issue of Time. Chiang on the cover of Liangyou after the outbreak of the Battle of Shanghai. 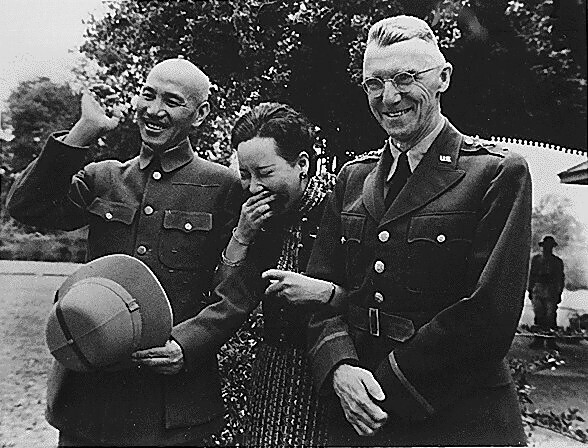 Chiang and his wife Soong Mei-ling with American general Joseph Stilwell in Burma in 1942. 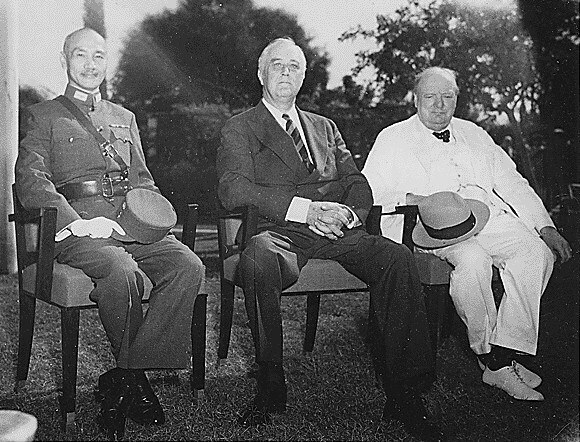 Chiang, American president Franklin D. Roosevelt, and British prime minister Winston Churchill at the 1943 Cairo Conference. Chiang's May 20 inauguration speech as the first president of the Republic of China under the 1948 constitution. A rock carving at Kinmen in Chiang's hand, reading "Forget Not that You are in Ju". Intended as a commentary on the Chinese republic's position relative to mainland China, it alludes to Qi's successful reconquest of its land despite having been forced into the single city of Ju by Yan during China's Warring States period. Chiang with American president Dwight D. Eisenhower in June 1960. Chiang presiding over the 1966 Double Ten celebrations. Chiang's body was not buried in the traditional Chinese manner but entombed at his former residence in Cihu out of respect for his wish to be buried in his native Fenghua. The entrance to Chiang's tomb at Cihu reads "The Mausoleum of the President Lord Chiang", using Chiang's official posthumous name in traditional characters and orthography. The National Chiang Kai-shek Memorial Hall in Taipei on Taiwan. Chiang Kai-shek with the Muslim General Ma Fushou. 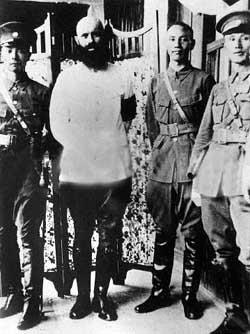 Mao Fumei (毛福梅, 1882–1939) Died in the Second Sino-Japanese War during a bombardment. 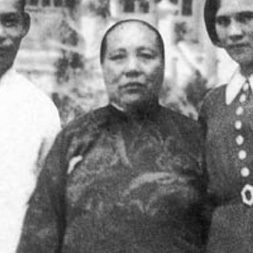 Mother to his son and successor Chiang Ching-kuo. Yao Yecheng (姚冶誠, 1889–1972) Came to Taiwan and died in Taipei. Chen Jieru (陳潔如, "Jennie", 1906–1971) Lived in Shanghai. Moved to Hong Kong later and died there. Chiang Kai-shek Facts for Kids. Kiddle Encyclopedia.